Although it may sound strange there are, in fact, a number of different options when it comes to refrigeration. Although American-style fridges are probably more commonplace in Premiership footballers' pads and you'll have something slightly more modest to contend with, you'll still need to get to know your appliance, work out how much food it can store and how best to use it. You're most likely to have one of these, as it's a cost- and space-efficient way of getting a decent-sized fridge and freezer into a kitchen. It will either be divided fifty-fifty between fridge and freezer space or there will be a seventy-thirty split, with the bigger section being the fridge. One of these units should give you ample space to store your food. Another option is a smaller fridge with just a freezer compartment (keep your fingers crossed that you don't have one of these!) or a separate under-the-counter fridge and freezer. If you're really lucky you'll have two full height units and you can stock up for the whole year in one shop. These are fantastic as it's just one unit but it's a lot bigger than a regular fridge- freezer, with the freezer section on one side, rather than under the fridge. This means it's easy to store and find items quickly. Only the most generous landlord will kit you out with one of these, but you never know. While you might be used to getting back from a trip to the supermarket and just throwing things into the fridge before putting the kettle on, it's better to take a bit of time to pack your food away properly. Keep meat and fish on the bottom shelf so that any juices won't fall on other food. If you have a separate salad drawer in your fridge, use it. It will keep fresh salad and vegetables separate from other food. Keep cheese in a box to stop the smell contaminating other food. Make sure tops are securely screwed onto opened jars and that any plates or bowls of leftover food are properly covered so that spills are avoided. As with everything else in the kitchen your fridge and freezer will need to be cleaned out on occasion. Whilst the fridge is relatively straightforward, the freezer will need to be switched off, newspaper and/or towels put on the floor and it will have to be properly defrosted. It's important to do this before ice builds up and starts eating into your storage space. 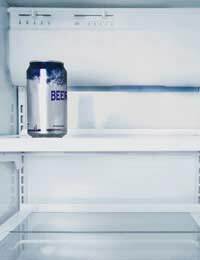 Student freezers also often suffer from 'forgotten beer bottle' syndrome, whereby an unpleasant brown slush will ooze out over the rest of the food. If this happens, take it as a hint that a clean is required. Making the most of your fridge and freezer isn't rocket science but these appliances are essential for the safe storage of food. It's worth taking the time to look after them and keep them free of spilt food and bad odours.